My journey began back in May 2011 when I stopped smoking after 30 years at the age of 44. 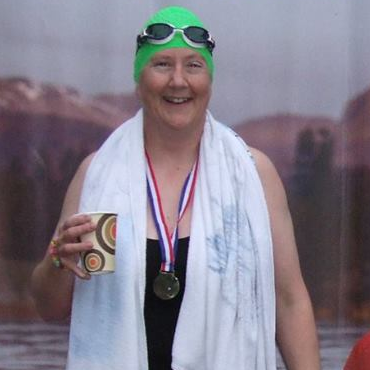 I’ve been an above knee amputee since the age of 27 and I decided swimming was probably the safest way for me to get fit again so I took the plunge in October 2011 managing 400m in an hour prior to crawling to the changing rooms completely exhausted. 2012 saw my 1st competitive open water swim of 500m followed by a 1500m swim later in the season. 2013 arrived with ambitions of swimming 5km around Buttermere – mission accomplished! 2014 and my next challenge – swim the length of Windermere and I did it! Having worn my wetsuit out it was time to go without and what a fabulous feeling to experience. These experiences have lead to me becoming the 1st disabled female to complete an Ice Mile – something I’m incredibly proud of and it will take a long time for my smile to fade. Thank you to everyone who has helped to make this journey possible. Never say never & keep smiling!